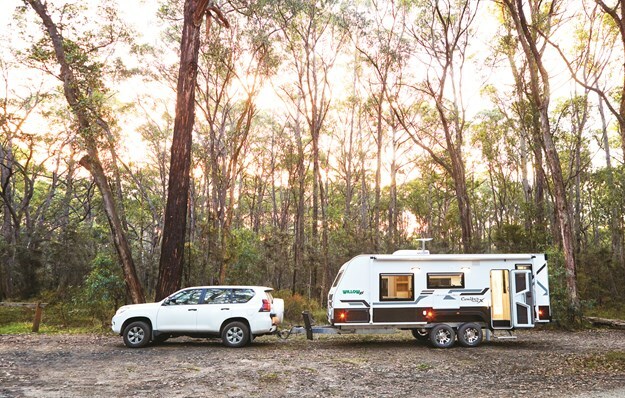 Willow RV commenced operations in January this year, but it's not fledgling by any stretch of the imagination. In fact, its two-man brainstrust—Eddie Wills and Ian Jow—bring decades of construction and design expertise to the table. Currently, they are based in a temporary factory in Pakenham, Vic, with the intention to move to a larger facility in the same area in the near future. 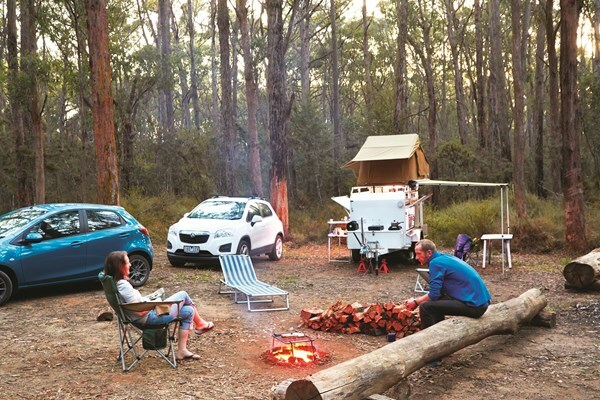 And some ‘winds of change’ were strikingly evident during CW's recent review of a Conifer 624X at Kurth Kiln Regional Park in the Dandenong Ranges. The 6.38m (20ft 11in) tandem-axle van certainly carried some significant points of difference including its exterior armour, stunning interior decor contrast, shower cubicle, and a German-made door. Beauty is not only skin deep, but the Conifer 624X is a ‘handsome devil’ bedecked in one-piece Insultuff composite (walls and roof) which is hail and dent resistant. And hiding behind all this is a rigid polyurethane (rot resistant) frame and high density foam. This frame/matrix forms an anchor to solidly secure the walls, roof and furniture. The one-piece floor also has a rigid polyurethane (rot resistant) frame and high density foam, which is composite clad with commercial grade vinyl on the top and a water-resistant barrier at the base. These combinations truly make this van a FULLY insulated van. And once you step inside the quality keeps flowing, highlighted by a wood-grain/glossy acrylic polarity in regards to the furniture. Another distinctive attribute is the ultra-modern shower recess, with a light and convenient shelving, and a shower hose mounted on silver-coloured fibreglass which gives off a futuristic feel. This contemporary cubicle is so spacious a bathroom baritone could bounce off some impressive acoustics. Meanwhile, the German-made entry door (featuring a built-in security door) is so well-refined it’s used by literally thousands of RVers around Europe. I was also smitten with the sheer volume of LED lighting, along with the spiffy cafe dinette upholstery. But back to its intended purpose. This Conifer, beefed up for increased offroad-ability, rides on a 6in chassis protected by a fully submerged galvanised coating, AL-KO Enduro Outback suspension and 15in alloys, with 235/75 R15 tyres. And it has adequate battery, solar and water capacities, albeit no grey water which is available as an option.The van's front has a window, stone shield and mudflaps, a water tap, a jockey wheel clamp mounted on the nearside of the A-frame, and an AL-KO offroad coupling offering amazing articulation. Twin 4.5kg gas cylinders are concealed in one of two divided compartments in the front boot. 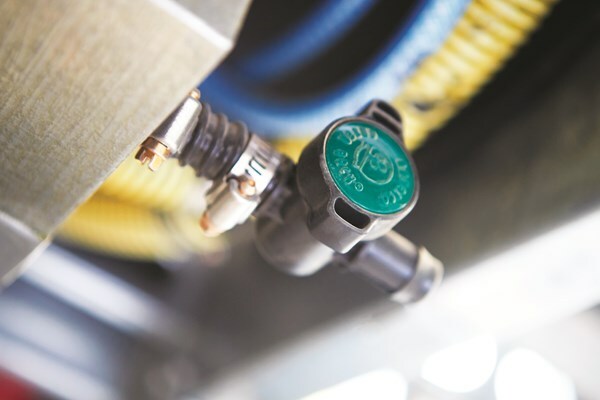 The front end of the van also features a tunnel boot and although there’s still plenty of room in the tunnel boot, a section of the offside is occupied by the hot water system. Meanwhile, the van’s rear comprises an easily accessible spare wheel mounted on a two-arm bumper bar, showy decals, and plastic moulding (high and low). Pizazz and pragmatism are the order of the day internally, highlighted by a comfy front bedroom complete with a caravan-queen-size bed with innerspring mattress and orthopaedic slats, excellent under-bed storage, robes with cutouts and USB ports, dressers, a bedhead with benchtop space, two overhead lockers, two reading lamps, good-size windows, an internal speaker, and a roof-mounted Houghton Belair 3400 reverse-cycle air-conditioner at the front of the bed. 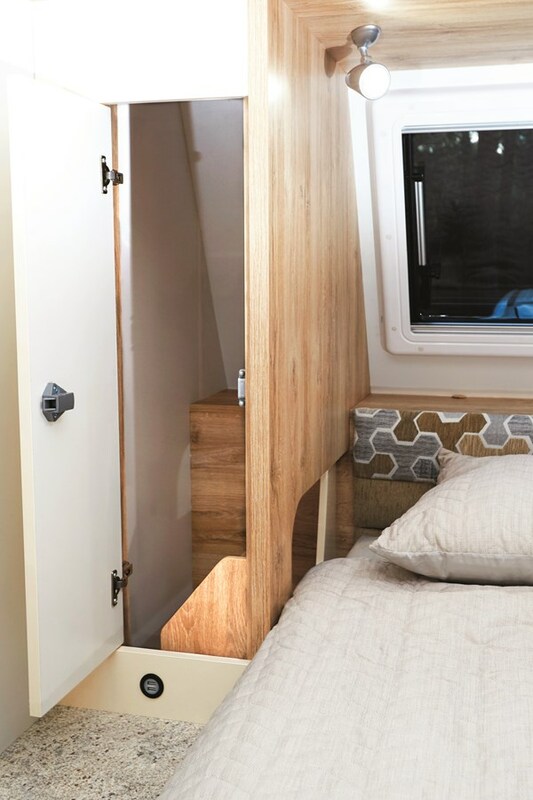 A cupboard (housing the electrical suite), plus shelving above, is located at the front of the bed on the offside, and above the nearside window are a double powerpoint and TV arm on a swivel bracket for the TV/DVD combo. A well-equipped kitchen sits proudly midriff alongside the nearside wall. 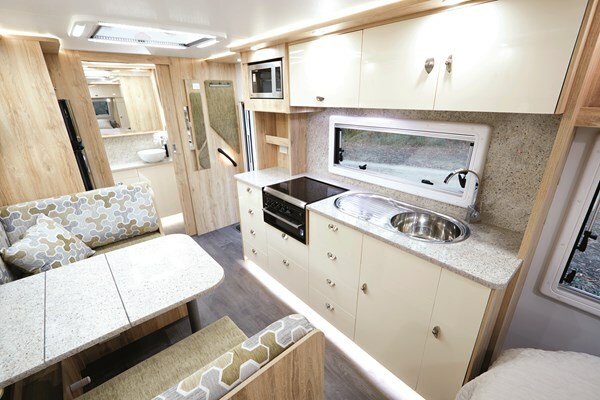 It really is a camping chef’s delight comprising a Swift four-burner cooktop and grill, stainless steel deep bowl sink with drainer and architectural tap, 12V LED rangehood with twin fans, a two-tier pull-out wire basket pantry, and slide-out drawers aplenty. A double powerpoint and spice rack are located above the benchtop, as is an LG microwave. An inviting cafe dinette, directly opposite the kitchen, will comfortably seat two. The footrests are ingenious—simply slide out a drawer at the side of the seating, lift out a square cushion and position on a base. A tri-fold table, window; four shelved overhead cupboards, two reading lamps, a double powerpoint and a speaker under each seat, plus two storage compartments under the table, completes the living zone picture. A 185L Thetford fridge/freezer (with black infill), plus an overhead cupboard above, is adjacent to the dinette. Meanwhile, dome lighting at near-ceiling level creates an ambience in the kitchen and dinette, along with a large Finch skylight that complements this Conifer’s well-lit and ventilated status. The rear ensuite is exemplary and testament to Eddie and Ian’s design nous. It not only features the aforementioned offside modern shower (left of the sliding entry door) but a Thetford toilet on nearside, and a window with skylight above. 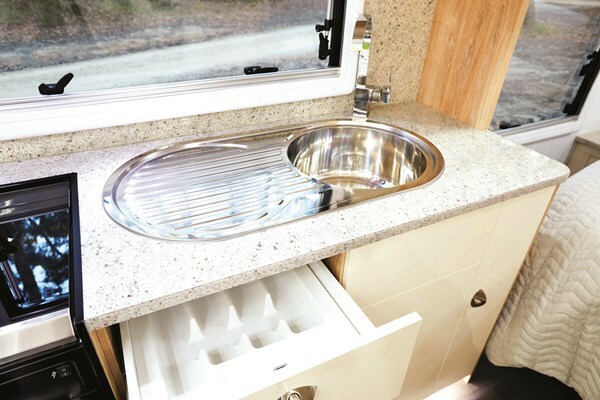 Commanding the majority of the rear wall is a large mirror, wall-mounted Daewoo mini-washer, plus a classy vanity with circular pedestal washbasin, architectural tap, double powerpoint and good benchtop space. Below is adequate storage space plus a concealed large laundry basket that’s ideal for storing dirty clothing. And immediately to the right of the entry door are a rectangular mirror, illuminated grab handle and a padded coat hanger. Also capturing my attention are the durable flooring, splashbacks to the kitchen and vanity, and double-glazed windows with built-in roller blinds and fly screens. I realise an offroader is about much more than visual appeal, but there’s no denying the Conifer 624X is a ‘good-looking rooster’. 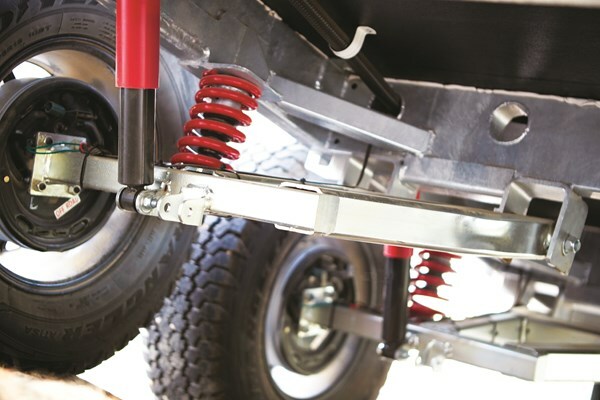 The review model comprised the 'Adventure Pack' consisting of 6in chassis main members, checkerplate wall cladding, AL-KO Enduro Outback suspension and an AL-KO offroad coupling. The owners also opted for a Carefree roll-out awning with LED strip light, a stoneguard, leg rests with storable cushions, and a washing machine. In this up-specced mode, the van looked every inch a bona fide offroad battlewagon. Methinks it could pay off to take more than just a first glance at the Conifer 624X.